Our Data Centre essentials offer products, solutions and services that facilitate the setup, installation, configuration and commissioning of Data Centre environments. In addition management and expansion of Data Centre environments can be optimized making them more secure, more efficient and more economical. The Serverlift solution allows for transportation and lifting of heavy IT Equipment in the Data Centre. The Serverlift will lift and transport up to a quarter of a tonne of IT Equipment safely into any Rack. It can lift Servers up to 2.4 metres therefore allowing the full use of space within the 19” Rack. Daxten offers both analogue and digital KVM (Keyboard, Video, Mouse) Management Solutions. These allow for administration, local control and remote access of physical and virtual servers as well as PDU’s, service processors and USB media to help the consolidation of equipment. In addition to Daxten’s own products we also offer solutions from Austin Hughes, Avocent, Emerson, Raritan and Rose Electronics. Analogue KVM Extenders ‘extend’ the local control interface of a computer with PS/2, Sun, USB or Serial Interfaces over distances of up to 300 metres, while IP based KVM extensions have no distance limitations. 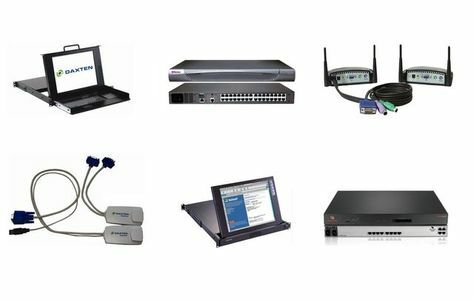 KVM Extenders can be used anywhere that a remote access is needed on a dedicated computer or on a KVM Switch already in use. Monitor Splitters, Video Splitters and digital signage solutions are used mainly on information boards in public places such as train stations and airports, although they can be used anywhere that a central message or information point needs to be visible and audible. LCD or TFT Rack Consoles with integrated KVM or KVM extenders allow verification checks and direct administration of all Servers within a 19” Rack locally or remotely via a Cat5 or TCP/IP remote workstation. Rack Consoles have an LCD Screen and a Keyboard to allow instant local Server access at the Rack down to the BIOS level. Daxten offers Consoles in different mounting widths and depths so that they can be installed into both standard and custom Racks. Console Manager allows for easy centralised management of Sun Servers, Routers, Switches, PBX’S and other network devices with a serial interface. Access to the serial peripherals can be done at any time and from any location as well as in band LAN TCP/IP or out of band via modem.